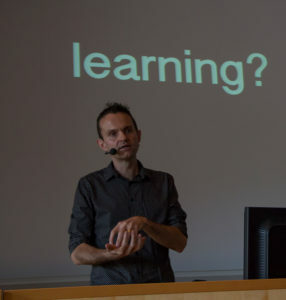 In his keynote, current Guest Professor with the Learning and IT group, Prof. Neil Selwyn (Monash University, AU), posed ten critical questions about IT and education. He raised issues concerning rhetoric around technology and learning, and whether or not technological solutions that often coupled with poor management and private interests have the power to solve the problems schools and teachers face. In addition to this critical discussion of the implementation of IT in schools, he offered ten solutions for moving the discussion and implementation of IT in schools forward. In the second keynote of the day, Dr. Ben Williamson’s (University of Stirling, UK) offered an account of how British IT curricula have been shaped by different interest groups. The government’s diminishing influence on curriculum has been replaced by think tanks, lobbyists, NGOs and private corporations. This has, at least occasionally, led to hasty and one-sided curriculum development. Following the keynotes, the speakers were joined by Ingela Bursjöö (City of Gothenburg), Anette Jahnke (iFOUS/University of Gothenburg) and Carl Heath (RISE Interactive) for a panel debate. During the discussion, the panelists shared their views on coding in schools and its relationship to more general educational and future economic/social goals. 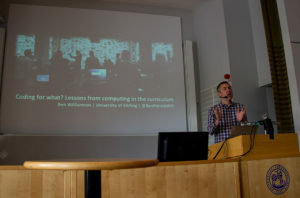 In the afternoon, members of GU_LIT together with colleagues from the LKIT group at the Department of Applied IT gave a series of research-led workshops with topics including educational game design, digital tools in preschool, professional development on social media, and assessment of multimodal texts. Föregående Föregående inlägg: Computer programming in schools… Can we avoid coding ourselves into a corner? Nästa Nästa inlägg: Programmering på schemat (igen) – hur gick det till?